Spending the holidays with the aunt that disowned her after her father’s death was definitely not on Fina’s list of things to do. But when the constable showed up at Oxford looking for her best friend Ruby, the girls need to get away from the college before one or both of them spend the holidays in jail even though neither of them has committed a crime. Fina used to love her Aunt Millicent, known to most as Lady Shillington. But after Fina’s brother was wrongfully hanged for the murder of Fina’s father. Lady Shillington cut all ties with Fina and her mum after the trial, so it came as a surprise that she would invite Fina for the holidays. Because Fina knows her brother was innocent, she and Ruby decide to find the real killer when visiting the village for the holiday. Unbeknownst to them, Lady Shillington has invited all of the people involved with the untimely deaths to celebrate the holidays at her home. Fina, Ruby and their friend Pixley are locked in a snowbound mansion with the person or persons that are undoubtedly the murderer or murderers. Will someone else die before Christmas dinner is served? Fina and her friends must find the killer but who can they trust to help trap the guilty person or persons? This historical cozy mystery set in the 1930s it is full of red herrings, twists and turns. Like all cozies, the murder is not graphic and the gumshoes are college students not police inspectors. But do not discount the detailed hunt for the killer using the only tools available to solve crime in the early 1900s, which pretty much amounts to good old brain power. This is the sixth book in the Ruby Dove Mystery Series. It is the first one I have read. It works fine as a standalone novel, but there were some references to previous cases that escaped me. 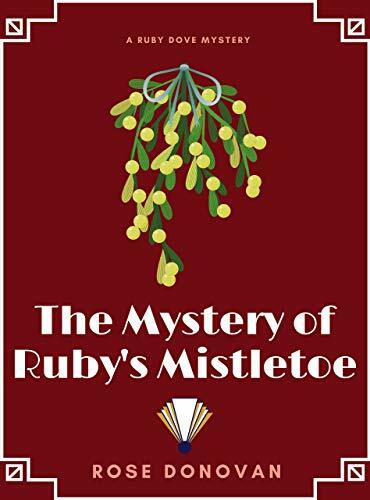 That is okay, because the reader in me will seek out the five previous books so that I can be privy to the inside jokes between Ruby and Fina as well as learn about their previous cases that were referenced in The Mystery of Ruby’s Mistletoe. DISCLOSURE OF MATERIAL CONNECTION: I have a material connection because I received an Advanced Review Copy (or ARC) on Reedsy Discovery in exchange for a fair and honest review. There is nothing worse than having your lying, cheating, thief of an ex-fiancé show up at your job, unless you are Juliet Langley. She clocked him right in front of her customers at Java Jive before he could finish his plea for her help. Never known for her subtlety, everyone in the coffee shop could tell she hated the man she just punched. After her boss settles her down, she agrees to meet up with Scott, the infamous ex, even though she was still understandably not happy to meet with the man that took all her money and caused her to lose her business. Not to mention he broke her heart. Things go from bad to worse when they meet as Java Jive closed that evening. Juliet was still steaming, but her boss Pete who is her best friend is there to keep her in check. Scott arrives looking rather sick, but is determined to enlist Juliet’s help finding his missing wife. Something shady is going on here and Juliet wanted no part of it. But when Scott collapses and dies right in front of Pete and Juliet she has no choice but to investigate. Especially since a detective holding a grudge attempts to pin a murder charge on Pete and Juliet. Against everyone’s better judgement, Juliet pairs up with her on again off again boyfriend police detective Ryder to find the real killer and kidnapper. As the case unfolds, bribery, illegal kickbacks and stolen drugs muddy it up. But soon the investigation turns from frustrating to dangerous as the real killer may be targeting Juliet to keep her from finding out his secrets. Juliet is a great main character for a cozy series. She is smart, funny and has more man trouble than she wants or needs. She has a neighbor that is basically a friend with benefits and Ryder is now dating her girlfriend. Juliet really doesn’t want him anymore, but sometimes the memory of what they had for a while haunts her. Then there is Pete. Good hearted, adorably cute and there for her no matter how crazy her life gets. They both have feelings for each other, but she is afraid to commit to a relationship and ruin their great friendship. 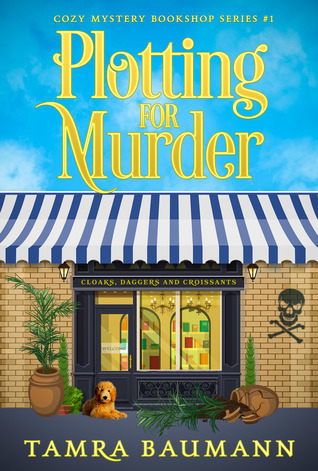 Caroline Fardig knows how to keep a cozy mystery true to form. Her books are funny, entertaining and always have a twist in the plot to keep her readers guessing. It is no surprise she is a USA Today bestselling author. With an interesting list of past professions; including funeral parlor associate and church organist, she sounds as interesting as her characters. This is not the first book I’ve read by Farding, and will not be the last. 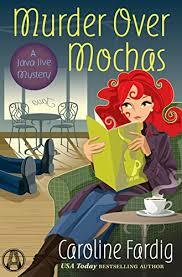 I highly recommend this book and series for cozy mystery fans. Carmela is crazy busy at Memory Mine, her scrapbooking and graphic design business. Everything is hopping with all of the Mardi Gras hoopla going on. But she is not all business; in fact, she and her bestie Ava are front and center for the Pluvius parade, known for fabulous floats created by “krewes” that have been together for years. This year’s overall theme is “Spirits of the Sea”. As the crowd swells, beads are thrown and bands blare. Everyone is having a great time until one of the floats begins to wobble, then rumble, and then explodes spewing an eruption of glitter and krewe members into the crowd, one of whom is Carmela’s ex-husband Shamus. Carmela and Ava have a front row seat, and are first to get to the man most seriously injured. The EMTs arrive, but to no avail. Hughes Wilder is dead. Was this a tragic accident or murder? Carmela’s sort of fiancé, Detective Edgar Babcock, arrives at the scene to investigate. Carmela’s mind is already churning with a list of likely suspects. Babcock warns her not to get involved, but both of them know it is futile. Carmela can’t resist poking around when someone gets blown up right before her eyes. Ava is Carmela’s willing accomplice, accompanying Carmela to various social events to help her get the skinny on the suspect list they have compiled. They still don’t know who killed Wilder, but there seem to be plenty of people that hated him enough to kill him. The problem is the murderer is on to them. Things really start heating up when someone targets Carmela and Ava. Babcock insists they stop investigating before one of them gets hurt or worse. But will Carmela listen? The characters are interesting and easy to like. They do things that anyone might do in New Orleans, with the exception of amateur sleuthing. Carmela, Babcock, Ava and Shamus are the perfect foundation to balance the various supporting characters. This crafty cozy mystery is full of action, humor and fun in one of America’s most vibrant cities. New Orleans is the perfect backdrop for murder and merriment and this book has both. I stayed in the French Quarter for a fabulous week a few years ago and was delighted to read about the characters visiting familiar places. One of my favorites is Lafayette Cemetery No. 1, so I was delighted to read the chapter that featured this historic last resting place of many New Orleans residents. Childs adds scrapbook tips and recipes at the end of the book. The tips are handy if you are new to scrap-booking and the recipes (based upon meals in the book) all look delicious. New York Times Best-Selling author Laura Childs writes several cozy mystery series, including this Scrapbook Mystery Series. Glitter Bomb is the 15th book in the series. It is the first one I’ve read, and it worked perfectly as a stand-alone mystery. But I am adding the rest of the Scrapbook Mystery Series books to my wish list for Christmas. 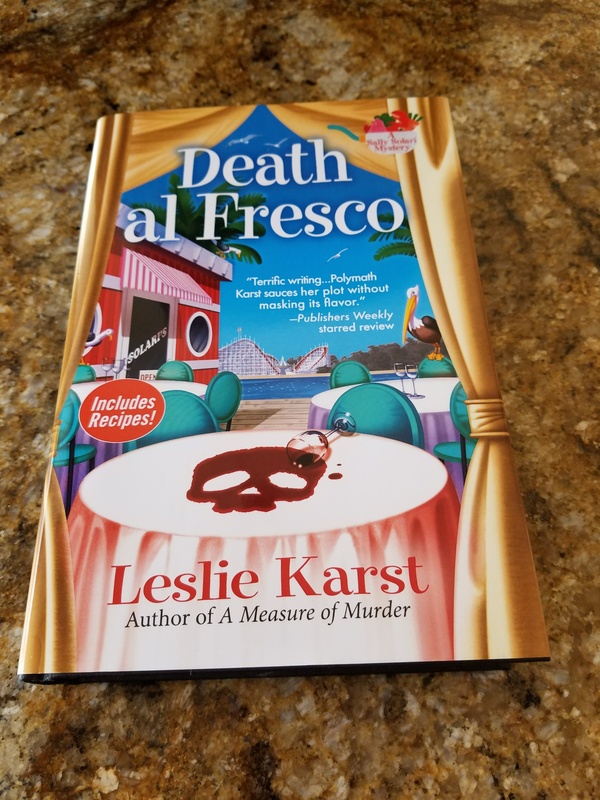 Sally Solari is back in the third cozy mystery written by Leslie Karst. Death al Fresco finds her torn between helping out her father and the police. She is happy distancing herself from her father’s restaurant to focus more on her own restaurant, which is doing quite well. But things could be taking a bad turn. Her chef is itching to begin a new phase of his culinary career just as her father is hosting a huge party and desperately needs her help to pull it off. As if that were not enough stress, Sally’s dog finds the body of a local fisherman on the beach. It doesn’t look accidental and her father may be the prime suspect! Against her better judgement, Sally realizes she has to investigate the murder in order to save her father’s restaurant and more importantly, keep him out of jail. While looking for the killer, Sally has to fit in trying to manage her restaurant, dealing with protesters at her father’s restaurant – who knew Columbus Day would become such a political nightmare and trying to relax a bit by taking a painting class with her ex. She is as busy as her readers, which makes her character come to life. Honestly, who can’t identify with the juggling most women do today to keep things on an even keel? Karst writes the perfect cozy mystery. She begins with a delicious storyline, mixes in a bit of murder, sweetens it up with a pinch of romance and then bakes it to perfection when the plot heats up. This is the second book in her series I have read. It works well as a stand-alone novel, but you might want to start with the earlier book(s) because I am sure you will be hooked and want to read the whole series. The added bonus to this series is the recipes at the end of the book. The Spinach Salad with Orange, Fennel and Black Olives sounds delicious. Since you can make the dressing a day ahead, it would be perfect for company. You will wow your guests and maybe loan them Death al Fresco so they can fall in love with the series too. Theodora (Teddy) Bentley is off on an unwanted adventure. Her demanding boss at Gunn Zoo ordered her to fly to Iceland to pick up some animals that the Reykjavik Zoo is sending to live in California. Teddy is less than excited about the trip, but at least she has the Zoo credit card to pay for everything. Iceland is an entirely different world than California – volcanos, ice flows, glaciers and a population that all seem to be related. Teddy is determined to make the best of her time there, viewing puffins in their native habitat as well as bonding with the orphaned baby polar bear she is bringing home to live at Gunn Zoo. Teddy is staying with Bryndis, the zoo keeper that will help transition Magnus (the baby bear) as well as a pair of puffins and a pair of Icelandic foxes that will round out the new Northern Climes exhibit at Gunn Zoo. Bryndis is also a member of a band, giving Teddy an opportunity to experience night life in Iceland after the zoo is closed in the evenings. While out enjoying the diverse island, Teddy accidentally stumbles upon a dead body. The puffin pecking at the corpse surely isn’t the murderer, but who would want to murder an American tourist? Simon Parr, the corpse in question, is a member of a bird-watching group with millions of reasons people may want him dead. First of all, he is the all-time biggest lottery winner in history. He seems to have a snarky personality and most likely a lover or two that his wife may or may not know about. Murders are rare in Iceland. But soon another bird-watcher from the group dies. Teddy doesn’t think it was an accident and finds herself in more hot water than she has bargained for. Even though she knows her fiancé Joe is too far away to help her and the local police have told her to keep her nose out of the murder investigations, she can’t help poking around, asking questions and irritating the remaining birders. Will she become the third victim? I loved this book and Betty Webb’s writing style. It is a cozy mystery with lovable characters both human and animal. Teddy is flawed, makes bad choices when murderers are afoot and is easy to like. Her escapades are crazy, yet believable and that is what I find so endearing about her character. Webb brings the flavor and people of Iceland to life for the reader without lecturing. She obviously did copious research to get the names, customs and environment correct. I also love the way she gives the reader an inside look at the animals and behind the scene info about zoos. This is the fourth in her Gunn Zoo series. It was refreshing to have Teddy go to an exotic place to introduce new characters and keep the series fresh rather than have another murder within close proximity to her home. 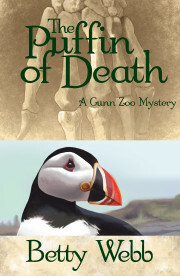 The Puffin of Death can easily be read as a stand-alone novel. There are a few references to the other books, but nothing that will be a spoiler if you read this one first – because I know you will want to read the rest of them as soon as you are finished.